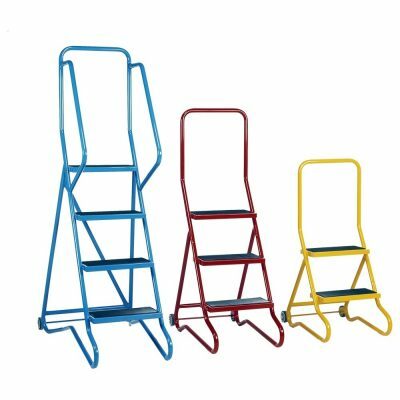 Our range of Wheel along Mobile Steps come in two types, Step and Two Step, both ideal for easy movement around warehouses, factories, offices and retail stores. The Health & Safety Executives urges employers and their workers to take into consideration working at height, even when using low-level steps. 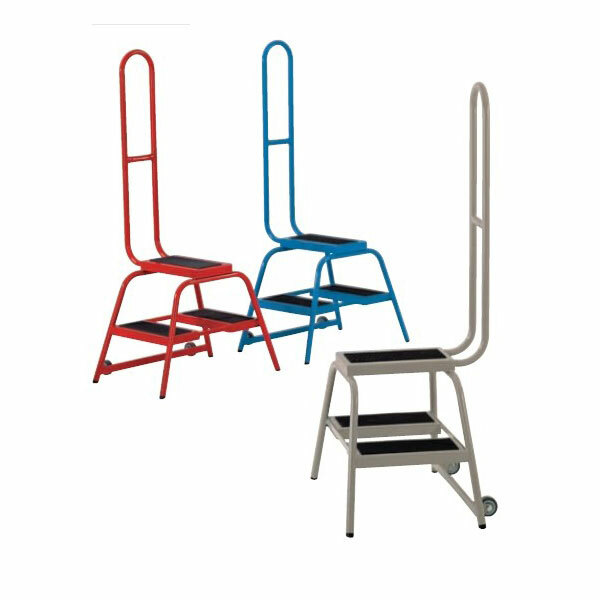 The Wheel along Mobile Steps are Ideal moveable access steps for warehouses, stockrooms, offices, libraries or hospitals. Guidelines have been set up to ensure safety when workers are reaching low levels and completing simple tasks such as changing light bulbs in offices, getting files from cupboard shelves or stacking crockery in a coffee shop. Ensure the step is placed firmly on the ground, the wheel along step is cleverly designed with an upper bend in the base that descends to the front of the steps toward the rubber anti-slip grips, this ensures the steps are secure and fixed and will not move whilst in operation. Fitted with 2 rubber tyres that allow for the steps to ‘tilt and move’, the mobility of the wheel along lowers the risk when the user is carrying light materials. Slippery steps can often be the cause of most accidents when using a mobile step, that’s why our treads are finished in rubber anti-slip, giving the user the confidence to complete tasks and light duties.